On Tuesday, the Associated Press reported that the Trump administration was quietly seeking to roll back the Environmental Protection Agency’s regulations on radiation exposure. The story took a closer look at a rule the EPA proposed back in April called “Strengthening Transparency in Regulatory Science.” When it was released, most coverage focused on the proposal’s potential limitation of what studies the EPA could and could not use in decision-making—it essentially demanded the EPA not use any studies based on data that isn’t publicly available. Ironically, the transparency rule is hiding another agenda. Paragraphs scattered throughout the document make it clear that the proposed rule is meant to re-evaluate the science behind “the dose response data and models that underlie what we are calling ‘pivotal regulatory science. '” That jargon means the EPA wants to challenge the assumptions that underlie its current guidelines on toxic exposure. “The so-called transparency rule is an insidious dodge,” said Rush D. Holt, a former congressman and current president of the American Association for the Advancement of Science, before a Senate subcommittee on October 3rd. “It apparently is about reducing regulation.” And though the actual rule is vague, comments in the press release and a July update to the EPA guidelines on radiation exposure make it seem that nuclear regulation is on the chopping block. Currently, the nuclear industry, the EPA, and other groups operate on the assumption that there is no safe dose of radiation, no matter how small. This is based on the “linear no-threshold” model (LNT). The LNT model is based on studies of people exposed to high and medium doses of radiation, including survivors of Hiroshima, Chernobyl, and Fukushima. That data shows that the higher the dose of radiation you receive, the more severe the consequences—in other words, that the response to doses is linear. The more radiation, the more health effects. Because it’s much harder to accurately measure small doses of radiation in large populations over long periods of time, there isn’t much data available on the lower end. Still, most scientists agree that the relationship stays the same for small amounts of ionizing radiation: Small doses increase the aggregate risk of cancer by a relatedly small amount. LNT’s prevalence pushes regulatory agencies, professional associations, and medical fields to keep radiation doses “as low as reasonably achievable” in all people, especially considering some groups (children, especially) are more vulnerable to radiation than others. ……..in a larger public-health sense, LNT is cautious and prudent. Just because there isn’t documented proof of harm at very low doses doesn’t mean harm isn’t being done, and an inaccurate model means that it’s also possible that LNT sometimes underestimates cancer risks from low doses. In the absence of more definitive data, multiple groups and studies—the National Academy of Sciences, the International Commission on Radiological Protection, and more—have recommended holding fast to regulations that keep radiation exposure as low as possible, at least until a new model is robustly tested and accepted. Others go even further and argue that small doses of radiation are good for you. Edward Calabrese, a professor at the University of Massachusetts, is quoted in the April EPA press release—he was glad the agency was “recognizing the widespread occurrence of non-linear dose responses,” and he appeared in the October 3rd Senate hearing on the rule. Although Calabrese focused on more mainstream criticisms of LNT before the Senate, his hormesis work is controversial. In 2010, Kristin Shrader-Frechette used Calabrese’s work as a case study of “special-interest science.” Shrader-Frechette compares Calabrese and others to the Queen of Hearts in Lewis Carroll’s Through the Looking Glass. “Just as the Queen claimed she could believe six impossible things before breakfast, SIS proponents often use scientific concepts/methods in ways that are ‘impossible,'” she wrote. She points out that Calabrese’s CV shows significant research funding from Atlantic Richfield Oil (ARCO), Dow Chemical, ExxonMobil, Proctor and Gamble, and R.J. Reynolds Tobacco. 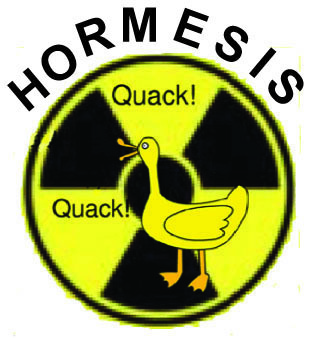 And despite Calabrese’s nearly 20 years of advocacy for the theory, even friendly reviews indicate radiation hormesis needs further scientific support.